RealPresence Trio 512-334-1100 or Email us by clicking here. The human voice is a powerful vehicle for delivering your thoughts. Have you ever heard someone speak and you instantly knew the feeling they were trying to convey by just the inflection of their voice? Tone of a voice can instill confidence or uncertainty. 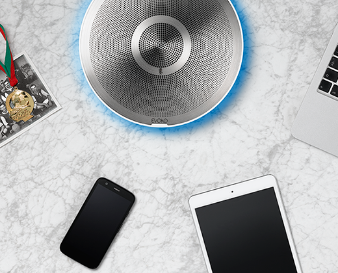 With RealPresence Trio we have enhanced our patented HD Voice technology even further to deliver deep, rich audio and even multi-media content playback, - the best ever. Even the best technology is not immune to its environment. Extraneous noises such as rustling papers, typing on a keyboard, or sirens outside a window are all too common in meetings and distracting to listeners. 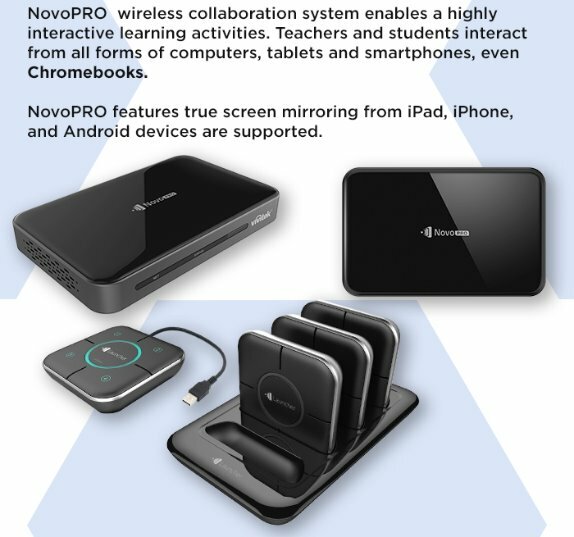 With Polycom's exclusive NoiseBlock technology, RealPresence Trio automatically mutes when background noise is present giving your conversation top priority.RealPresence Trio also extends the audio experience by making it easy for you to bring your own device (BYOD) and access your own virtual ecosystem through wired or wireless pairing for mobile phone and soft-client audio calling. When words aren’t enough and you need to share your ideas, concepts and images visually, RealPresence Trio is the only smart hub on the market flexible enough to include HD content sharing from your own device (BYOD) including your mobile phone, tablet or PC.Sometimes you just want to collaborate more effectively with people who are in the same room. Sharing content and rich media is simple-to-use in or out of a call.With so many ways to collaborate, sharing ideas can sometimes feel complicated. Who wants to learn yet another interface? Thankfully, RealPresence Trio supports content sharing using familiar interfaces such as Skype for Business (Microsoft Lync) or Polycom RealPresence solutions with SmartPairing. The Audio Hotspot first takes analog audio feeds and converts them to digital audio signals. The digital audio signals are sent to a processor, which converts them to bitstreams and assigns each bitstream a unique channel number. The channelized bitstreams are sent to the hotspot network, where wi-fi access point(s) broadcast them to portable devices. Each portable device uses a downloaded App to tune to the channel for the audio they wish to hear. In this diagram, channels 1-4 contain the audio for television displays 1-4. In a sports bar, or exercise club, the client would choose the channel for the TV, and hear the audio through their portable device speaker or earphones/headphones plugged into the headphone jack. The Audio HotSpot requires a connection to the internet. An Administrator Portal allows the Audio HotSpot owner/manager to create advertising and other content to be displayed on the portable devices. The internet connection from the HotSpot system to the Administrator Portal maintains the operating software and HotSpot service. Since the HotSpot includes external internet access, the client's portable device can also use the internet while they are connected to the Audio HotSpot network. 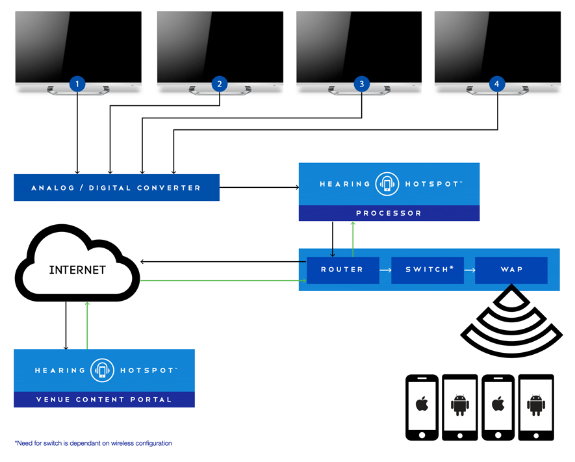 The Audio HotSpot is an innovative, new listening technology that allows any venue to stream audio via Wi-Fi from TVs, music sources or live programs directly to an individual’s smartphone or tablet. To listen, an individual simply connects to the local Wi-Fi, downloads the free Audio Hotspot™ app from the Google Play or Apple App Store, and selects the audio channel they want to hear. Each Audio HotSpot system is customized, consisting of hardware components and a proprietary software license. Once a system is installed in a venue, the software license is activated based on the number of channels (up to 56) at that venue. We are solving all sorts of under table cable messes with Connectrac. Click here to contact one of our AV Account Managers today for a free estimate. How cable friendly is your conference table? You've heard about ClickShare, but how does it work? 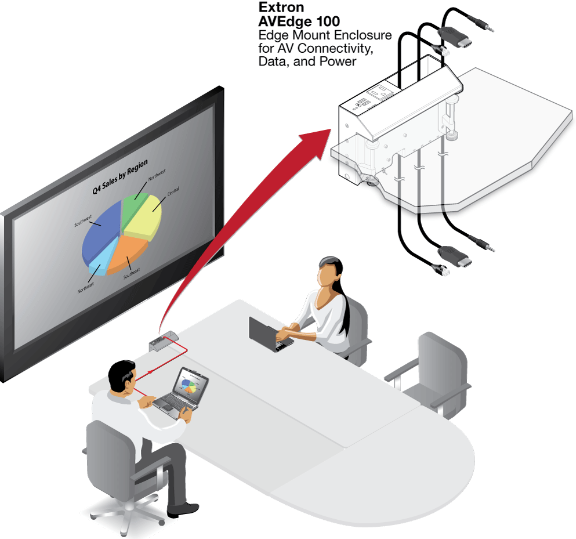 Watch a short video about the ClickShare wireless presentation solution. We see much success with this wireless solution, often customers request additional ClickShare devices to be installed. 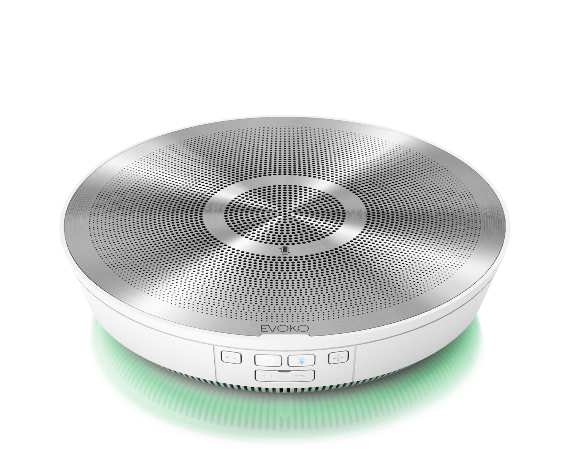 It makes perfect sense as it is another way to keep conference rooms user friendly with a standards based wireless presentation solution. 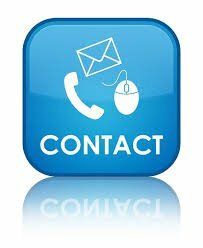 Request a demo or quote today, just email our sales department here. What is #Smartkapp ? This #Austin company can tell you more. 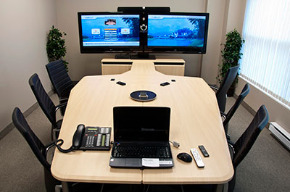 Authorized Reseller Visual Innovations helps companies #collaborate with Smart products. Request a discounted price quote on the #SMARTkapp here. Put it up. Plug it in. Create. Store content as snapshots on a mobile device. Automatically share snapshots to your #Evernote™ account. Remote participants can be invited to view content in real-time using any browser. 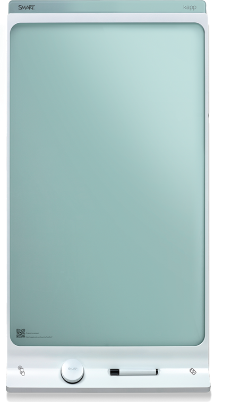 Write and erase on the sleek, glass surface without ever staining it. Shared content is immediately deleted when you disconnect your device. Contact Visual Innovations for quick quote or demo request. 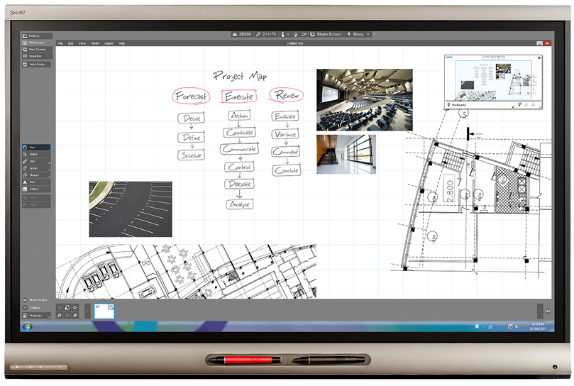 Our 90" Touch Table offers a productivity platform like no other. Typical uses range from Architectural & Land Development to Aerospace Design to True Interactive Meetings. We can assist in deployment, collaborative engagement with multi-location installations and user training. Contact our sales team for special pricing at sales@vicav.com. The Extron DVS 605 is a high performance video scaler that includes three HDMI inputs, two universal analog video inputs, and simultaneous HDMI and analog high resolution outputs. The DVS 605 accepts a wide variety of video formats including HDMI with HDCP, HDTV, RGB, and standard definition video. It features advanced Extron video signal processing with 1080i deinterlacing, Deep Color processing, and true seamless switching for professional-quality presentations. Designed for professional AV integration, the DVS 605 offers flexible control options including Ethernet, RS-232, USB, and contact closure. The DVS 605 is available in models with audio switching plus HDMI audio embedding / de-embedding, and also 3G/HD-SDI output with genlock. 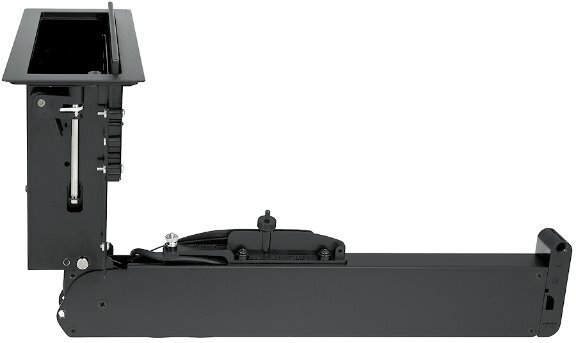 To accommodate a variety of sources, the DVS 605 features three HDMI inputs plus two universal analog video inputs that can automatically detect and process RGB computer-video, HDTV, component video, S-video, and composite video. The DVS 605 provides the capability to integrate digital and analog video devices, with HDCP compliance to enable integration of Blu-ray Disc players and cable or satellite HD receivers. Auto-switching between inputs streamlines system operation as well as integration with presentation switchers or matrix switchers. To enhance and simplify integration of sources and displays, the DVS 605 Series features two exclusive Extron technologies: EDID Minder and Key Minder. EDID Minder automatically manages EDID communications between the display device and all the HDMI and VGA computer-video input sources. 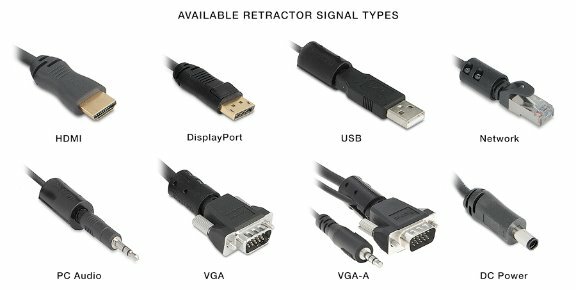 For HDMI signals with protected content, Key Minder authenticates and maintains continuous HDCP encryption between input and output devices to ensure quick and reliable switching in professional AV environments. 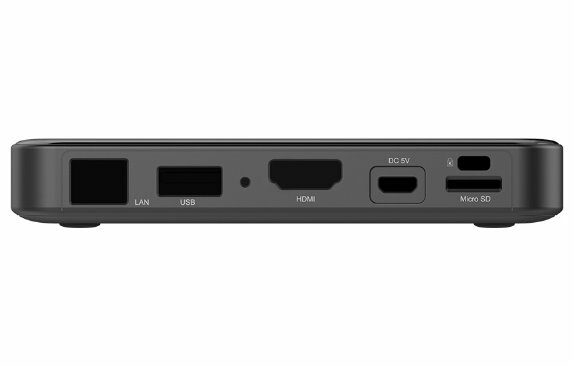 When receiving an HDCP-encrypted HDMI input source, the DVS 605 outputs a full-screen green signal on any video output connected to a non-HDCP compliant display. This provides immediate visual confirmation that the protected content cannot be viewed on this display. The DVS 605 features an advanced, high performance 30-bit scaling engine with the ability to scale HDMI, RGB, HDTV, and standard definition video signals up or down in resolution. This advanced video processor also features high performance deinterlacing of 1080i and standard definition video to deliver optimal image quality through advanced motion compensation. The DVS 605 accepts and outputs signals up to 1920x1200 including HDTV 1080p/60 and 2048x1080. It provides simultaneous outputs for HDMI and analog RGB or HD component video. An additional 3G/HD-SDI output with genlock is also available. The advanced video processing in the DVS 605 enables high quality, professional presentations with true seamless switching between Inputs 1 to 4 with selectable cut or dissolve transitions. The DVS 605 also features a flexible PIP picture-in-picture mode that allows any two video sources connected to Inputs 1 to 4 to be shown on one display. Several PIP presets are available, including side-by-side windows, and the PIP window can be dynamically sized and positioned anywhere in the image. All DVS 605 models provide lip sync delay and level adjustments for embedded HDMI audio. The DVS 605 A and DVS 605 AD feature five input audio switching to accompany incoming video sources. Gain and attenuation can be adjusted for each analog input, and the DVS 605 provides master volume control. DVS 605 models with audio switching feature HDMI audio embedding and de-embedding. Any input audio signal can be embedded onto the HDMI output. DVS 605 audio models can also extract embedded HDMI audio to analog and digital S/PDIF outputs. The DVS 605 AD, with audio switching plus 3G/HD-SDI output can embed up to eight channels of audio onto the SDI output. The DVS 605 features front panel controls for quick access to functions. Remote configuration and control are available via RS-232, Ethernet, and USB, plus contact closure to control input switching. 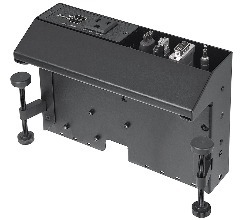 The DVS 605 is housed in a 1U enclosure and can easily be integrated into many environments. 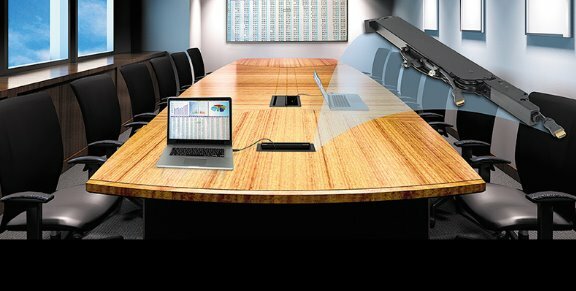 Designed primarily for the telepresence market, VC-Table brings a clean high-tech look to today’s conference rooms. Table features cable management and custom cutouts for accommodating your electronics grommets/cubby’s for easy plugging in of laptops or USB keys and displaying on screen. Its built-in equipment rack can house a codec or PC with ten rack units easily accessible from front and rear. Scratch resistant thermal wrap finish available in many colors. Also offered as stand-alone. 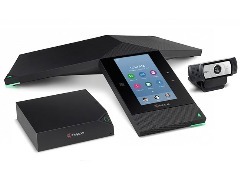 From here we add a Video Conference engine and camera with an executive friendly and simple to use remote control complimented by either a single large display or a dual display set-up providing a productive working environment. The LightRaise projector is a pen-enabled, ultra-short-throw projector that can turn nearly any surface into an interactive learning space. As part of a comprehensive educational technology solution, the LightRaise projector includes the award-winning SMART Notebook collaborative learning software, which teachers around the world use to create and deliver engaging lessons to over 40 million students. Educators using the LightRaise projector can also access the SMART Exchange™ website (exchange.smarttech.com), where they can connect, share and download over 51,000 digital resources. The projector also comes with a rechargeable interactive pen, a pen holder, USB and VGA cables and an easy-to-install wall mount. The LightRaise 40wi interactive projector offers educators an affordable option for making classrooms interactive. 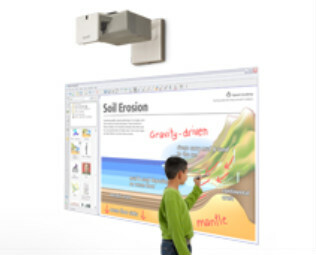 The projector can produce screen sizes up to 100" (254 cm) in a widescreen format, making it a flexible solution designed to fit into nearly any classroom or collaborative space. With its ultra-short throw, the LightRaise projector eliminates most shadow and glare and delivers a crisp, bright image. Teachers and students can use the interactive pen to write over applications and digital content, making lessons more engaging. As part of SMART education solutions, the LightRaise projector integrates seamlessly with other SMART products such as the SMART Response™ interactive response system, the SMART Document Camera™ and the SMART Slate™ wireless slate. Additionally, the LightRaise projector is protected by SMART Projector Care, a three-year service and warranty program offering fast and reliable support to customers. For more information on the LightRaise 40wi interactive projector, CONTACT the Sales Dept via emailfor an immediate response. We are pleased to announce that the TLP 710CV is now shipping. 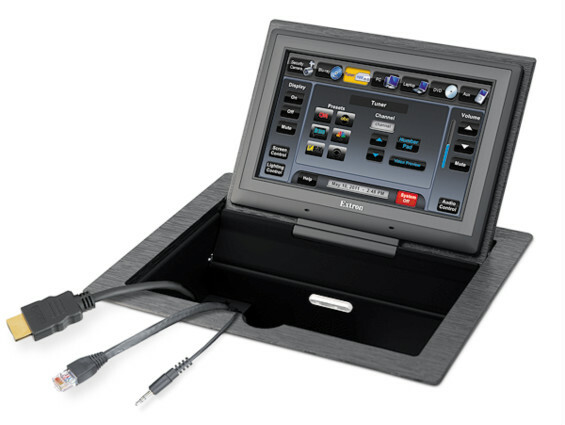 This 7-inch, fully configurable touchpanel combines AV system control with the convenience of an Extron Cable Cubby enclosure. 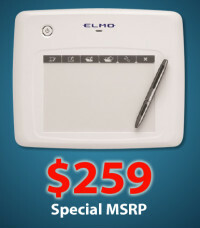 It features a flip-up, full-color, 800x480 resolution touchscreen in an elegant, metal enclosure that can be mounted securely into a tabletop, lectern, or other flat surface. Power over Ethernet - PoE allows the touchpanel to receive power and control over a standard CAT 5-type cable, eliminating the need for a local power supply. The built-in MTP twisted pair receiver accepts either S-video or composite video signals over an additional CAT 5-type cable. 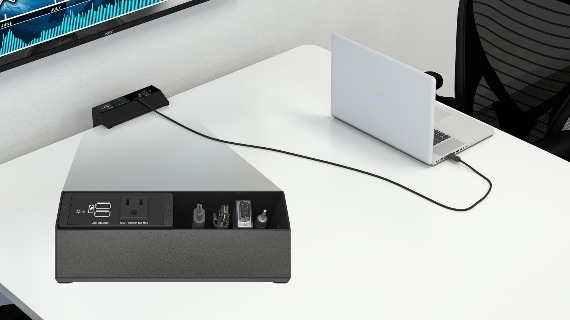 This enhanced connectivity provides integration flexibility and aids in cable management by minimizing the number of connections at the touchpanel. 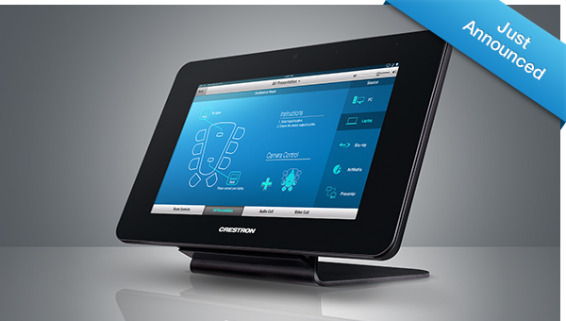 The TLP 710CV enables integrators to deploy furniture-mountable, fully configurable touchscreen control, with cable management and easy access to AV connectivity and power.